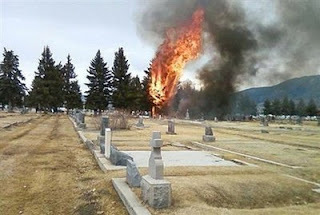 Picture provided by the Montana Standard shows a small, single-engine plane bursting into flames in Holy Cross Cemetery on the outskirts of Butte, Montana. US investigators are searching for clues after a small plane taking children to a ski trip crashed in a cemetery in the state of Montana, killing 14 people on board. Family of Irving ‘Bud’ Feldkamp, Owner of the Nation’s Largest Privately Owned Abortion Chain, Dies in Montana Plane Crash.